Sally Goddard Blythe, director of The Institute for Neuro-Physiological Psychology, says that what is important is using music, singing and lullabies to playfully get a baby ready for language. She suggests using fairy tales to teach moral behaviour and empathy. 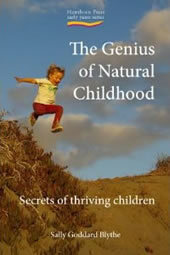 She shows, using neuroscience, how movement with singing games such as Pata-cake, Pat-a-cake and rough and tumble play enable children to learn motor skills and self control naturally. Without such activities, a large proportion of five year olds are held back by baby reflexes, which can stop them holding a pencil properly or learning to read, for example. A Northern Ireland study found traces of baby reflexes in 48% of first year children and 35% of fourth years.